Finally think ive got this tank setup to the point im willing to share. 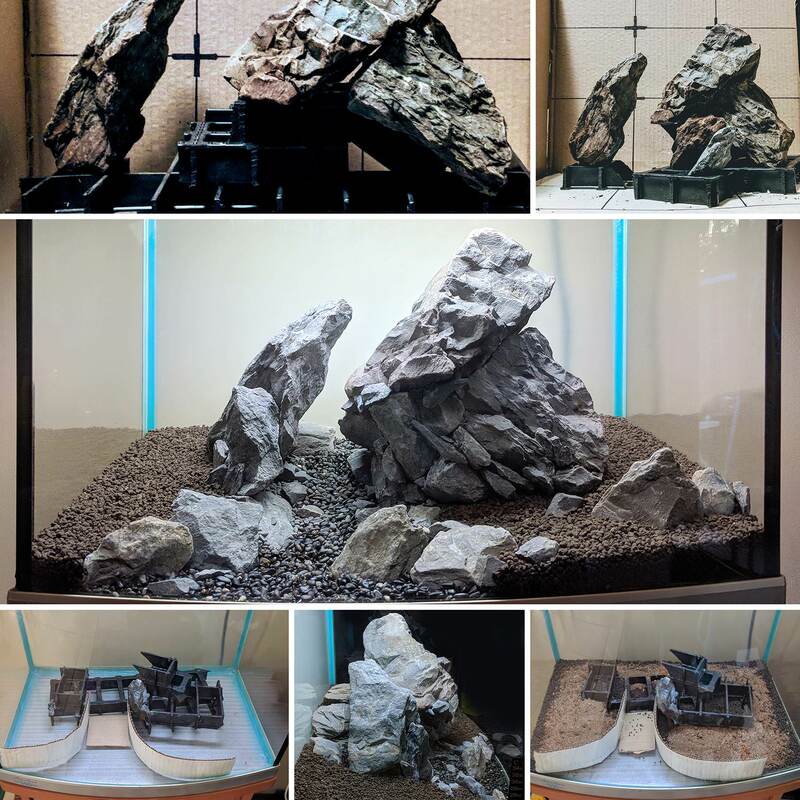 This was a spare Aquaone Aquastart 500 tank thats been sitting in my shed for around 5+ years... We have a 215L setup in our lounge but with a young family tank time just wasn't a priority, we almost put them both up for sale but my wife wanted to give the 215L one last go so she set it up and I got the bug again. I wanted to re scape it but thought ide get this one started for now and since ive got the 215L to a happy medium before it gets torn down and re done in a few months time. Stone found locally, glued together and installed on a plastic grid to take its weight and not sink into the sub. I had originally planted this tank last week but made a few choices I wasn't happy with so re planted it last night along the lines of what I was originally trying to achieve. As things evolve these plants might change, depends what takes. 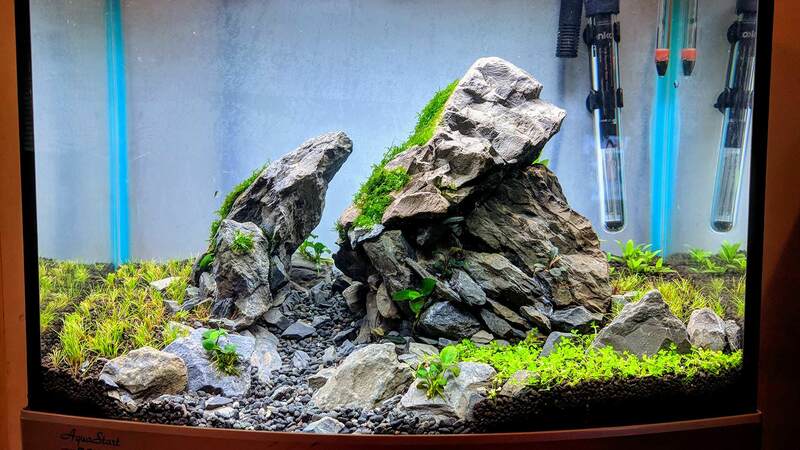 Moss - at present there is a small piece of Java on the main rock, this will come out eventually and be replaced with fissidens or mini pellia. Not too sure what just yet, thinking of letting the tank establish a bit more. When I re planted last night I was happy to find that the DHG had started to send out runners after 1 week. I planted 2 more pots of the DHG and filled in the left side from front to back and half of the right side. 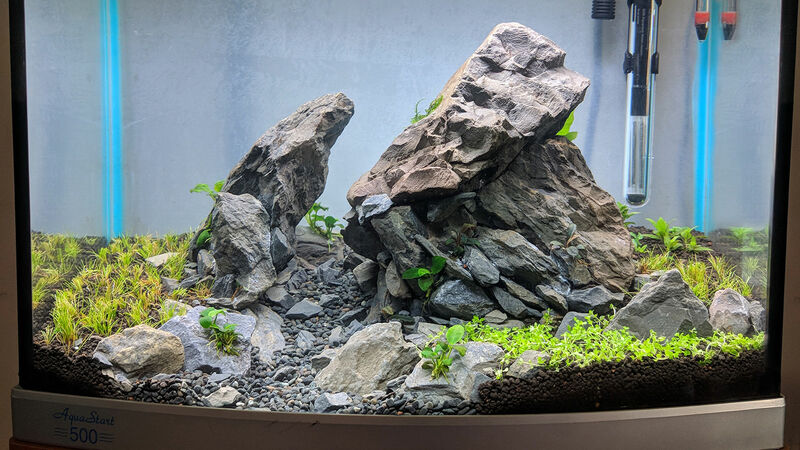 Im planning on growing something with some height in the back right corner and behind the main rock, for now its go the S.Repens in place, mainly because I had it and its growing well in my eco system. 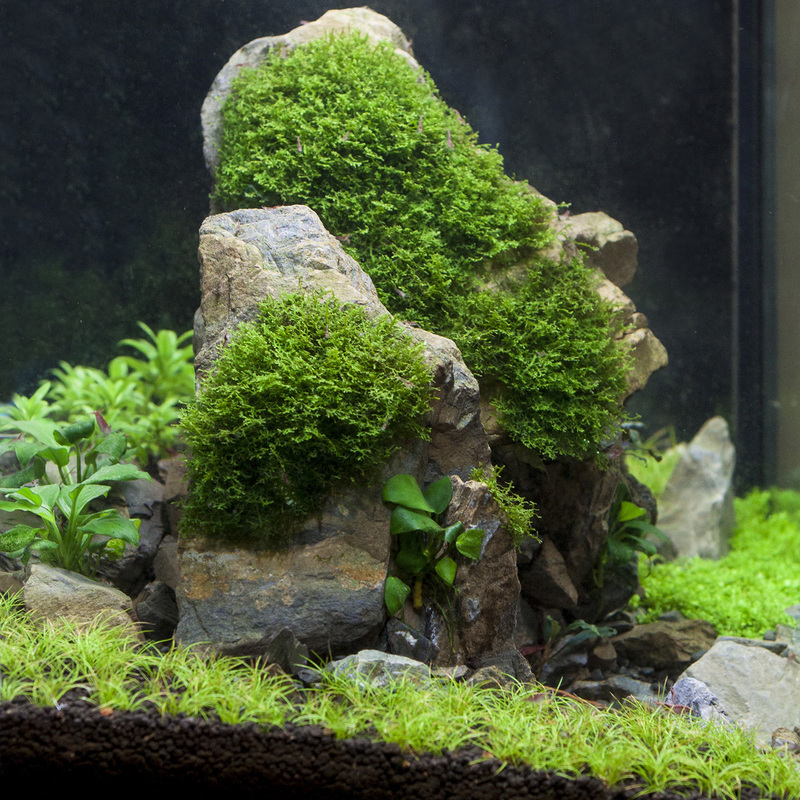 Ide like to change it out eventually for possibly Long Hair Grass or something like Dwarf Sag, Blyxa Japonica. For now the Repens can grow there. Im hoping the MC works, the area its to carpet is small, what ive planted there was 3/4 of the pot to give you an idea of the size of the patch. If it takes awesome, if the experiment fails I might put the DHG in there. Fingers crossed. I know itll be slow, there is a pretty good started patch in there so we will see how it evolves. Otto or SAE, ide prefer an Otto for its size. just want to ensure the tank is mature enough before introducing an Otto. Overall im really happy with this for my first scape. Still going to the cycling phase before introducing any live stock. Last edited by FishyFellow; 26-10-18 at 09:10 AM. I really like this setup! Consider some nerite snails early on as a form of insurance. Yeah I must admit im slightly worried about this. Im starting to dose a low amount of Excel into this tank, im hoping not to get smashed by algae but hey, its a learning process. Ive considered DIY CO2 but im worried about it getting inconsistent. Also considered one of the Sodastream kits as they 'look fairly cheap' to setup but the cylinders are quite small. Refils are about $18-19ea but I reckon they wouldn't last too long compared to a bigger canister. But after a quick read HERE i reckon it would be easier to do it properly. Lights are on for 7hr with a split photoperiod. 3hrs in the morning when im home and 4 hrs when I get home from work. The lights in this tank are pair of 11W PL's so the lighting is pretty low. Last edited by FishyFellow; 26-10-18 at 09:33 AM. Keeping lights low will be your friend. 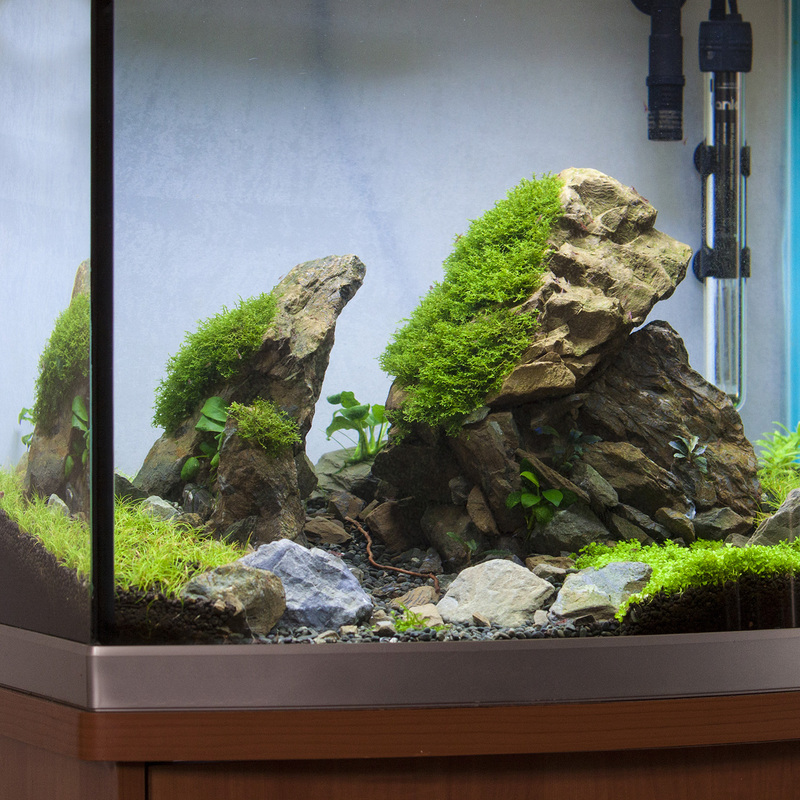 Make sure you attend to any algae on a daily basis. Don't do DIY CO2. It's more trouble than it's worth. Small update on this tank. 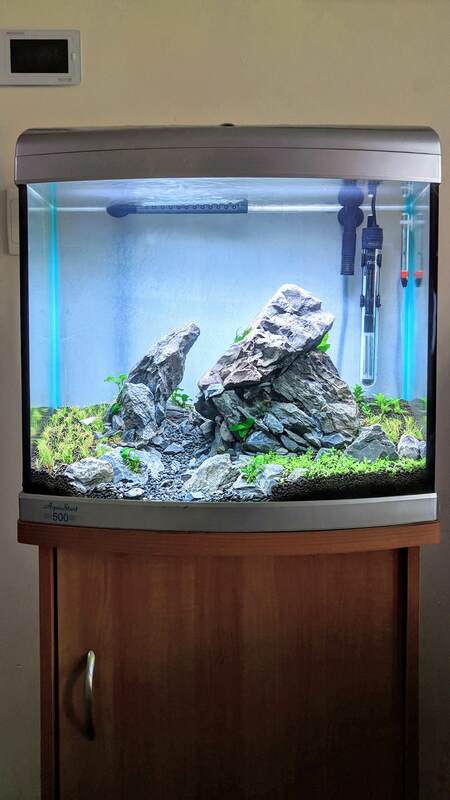 Cycling has been going well on this tank, no major issues so far. I picked up some Mini Pellia from my LFS for $12 which was enough to cover the tops of the two main stones. Thats been on for about 2 weeks now and is showing growth this week. DHG is sending runners and new shoots and the Monte has had a small amount of acclimatising but is sending its shoots into the sub and doing pretty well. One of my Buce's sent its first new leaf this week as well, happy to see that plant start to grow. Hoping to stock this soon but im in no major rush to do so. When its ready its ready. 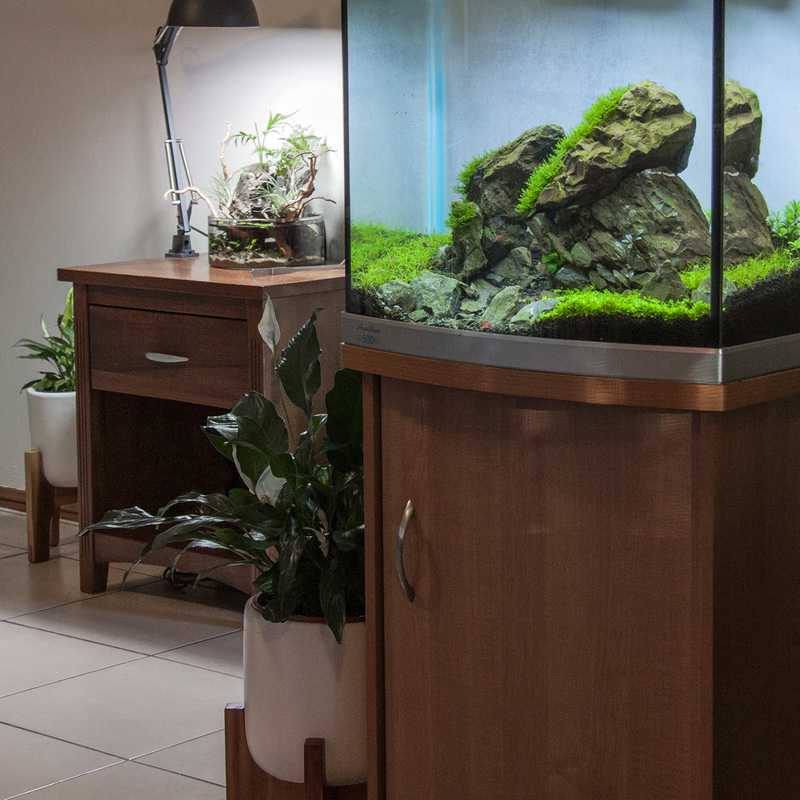 Looks really good mate - my only gripe is that foreground anubias pulls attention away from your beautiful hardscape. Pellia was a good pick, really breaks up the silhouette on the stones. I have 5 neon tetras and 4 red cherries in here for now whilst I sort out what I want to stock this tank with. There is a bit of flow from the spreader bar and currently the neons are staying in the bottom half of the water column so they can bother the shrimp a little bit. I have two female and two male cherries and I plan on having a lot more. I didnt want to move any more than what ive setup incase there were any unwanted deaths so my main tank is housing the rest of the colony. If the 5 neons are good come the weekend ill probably add a few more on the weekend/mid next week and get the system use to the bioload before swapping them out for what I want to stock the tank with, I hope this theory will work? As for fish. I originally wanted to stock Galaxy Rasboras but im not so sure now given they prefer a heavily planted tank. 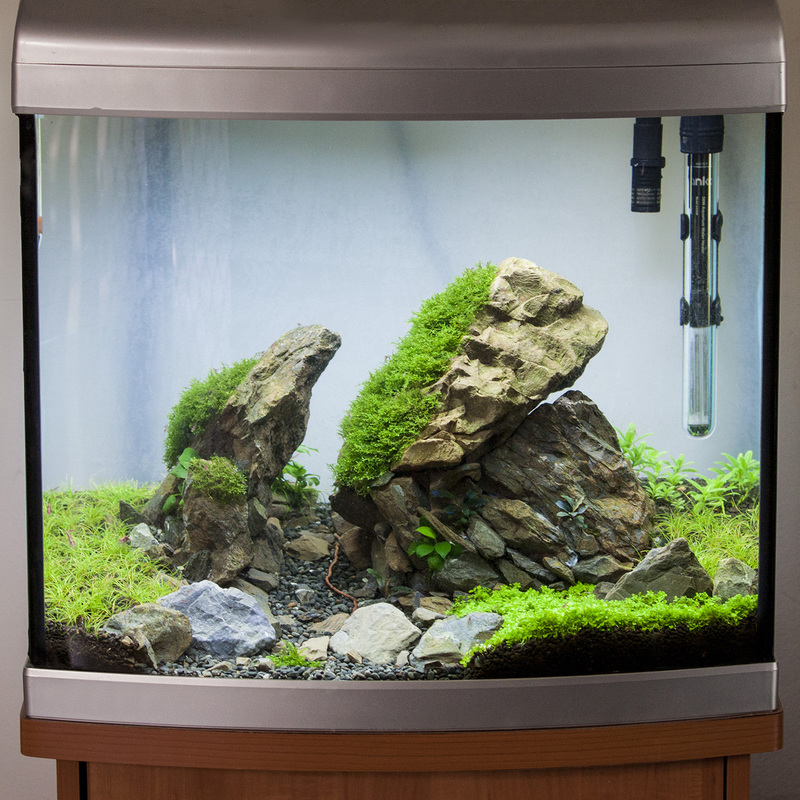 Im now thinking something that will swim in the top half of the tank would be great as this area is devoid of scape and plants, ideally ide like them to be small and colourful. Im considering x10 Leopard Danio's or Zebra Danio's as they seem to like flow and are active swimmers, altho ive read they do like a long tank, altho 10 might be too many but ide like a descent sized school of little guys. Ill put a Oto or two in here but want to let the tank mature a bit more before adding these guys. Any thoughts on what you would stock in here. Its 65L and 50x35x35. Last edited by FishyFellow; 20-11-18 at 01:43 PM. the ideal fish in my opinion would be emerald white clouds (Taenichtys micagemma). Bayfish had them recently but unfortunately I was too slow cottoning on. Pigmy cories are fun to watch. Rasbora hengeli are pretty though a bit boring. Be different and use killifish perhaps. Rasbora maculata could be a goer but they are quite active at all levels. Been a while since I updated any pics from this tank so here goes. Been ticking along nicely considering this is running no C02 and is pretty low light. The 10 shrimp I started with have all bread and there is around 60 in here at the moment, all slowly growing up. Apart from green algae on the rocks which I kinda like the look of there has been no issues to really report, glass gets build up but thats provides for my nerite so all good there. Glass gets a good clean about once a month. The Buce puts out around 1 leaf a month, but with 3 in here they tend to go one at a time so once the last has grown there is only around a 2 week window before the next plant is throwing out another leaf. I had to give the Mini Pellia a big trim last weekend as it was getting a bit full on, Pics are post trim. I also took out the s.Repens last night and replaced it with some MH (Hemianthus micranthemoides) finally. I couldn't find HM when I planted this initially but really wanted to add a small leafed stem to the back I decided it had to be done. 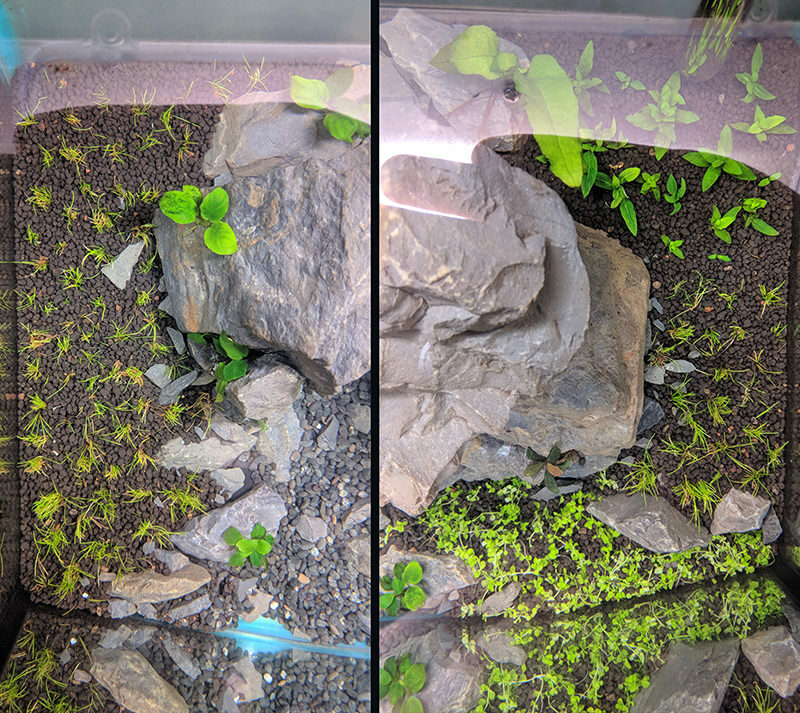 Ive planed it on the right where the Repens is in these pics so ill have a chance of hiding the hardware and if it takes off ill probably add a smaller bit to the left side as well.